They are all fire, and every one doth shine. But there's one in all doth hold his place. Caesar, in his own view, wasn't a servant of Rome; he was Rome. He wasn't subordinate to the law; the law was an emanation of his sovereign will. 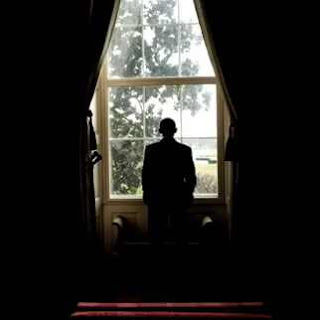 He was self-enraptured, self-fixated, megalomaniacal – in a word, presidential. Barack Obama rarely indulges in public displays of dictatorial arrogance. He leaves it to underlings like Eric Holder, Leon Panetta, FBI Director Robert Mueller, and Senate Majority Leader Harry Reid. In testimony before separate congressional committees on the same day (March 7), Panetta and Mueller made clear the president’s view that his power to kill people is not subject to congressional checks or legal restraints of any kind. In testimony before the Senate Armed Services Committee, Secretary of Defense Leon Panetta pointedly refused to recognize that Congress, not the president, has the constitutional authority to commit the United States military to war overseas. Panetta provoked outrage among conservatives by claiming that the UN Security Council or NATO could authorize military intervention abroad. However, less attention was paid to the fact that Panetta’s formulation cut Congress out of this matter entirely – a logical and predictable extension of the Bush administration’s claim that the president, in his role as Grand and Glorious Decider, has plenary authority to wage war wherever he chooses, against whatever target he selects. On the same day, FBI Director Robert Mueller was asked about Holder’s claim – made before an audience of law students at NorthwesternUniversity a few days earlier -- that the president can order the execution of American citizens without trial or due process of any kind. Mueller was specifically asked if that applies to Americans living at home, as well as abroad. He artlessly ducked the question by claiming he would “have to go back” and check if that was addressed in administration policy. The president has not been granted the authority to order the assassination of anyone, of course. Doing so is (in descending order of seriousness) an act of criminal homicide and an impeachable offense. Or at least it would be considered as much by anybody other than those who subscribe to the perverse idea that the president is a figure who transcends the law, who “unassailable holds onto his rank,” irrespective of the moral nature of his actions. This was the essence of Eric Holder’s detestable claim that a presidential kill order, made in secret on the recommendation of an anonymous, unaccountable panel of underlings, satisfies the requirement of “due process.” That vile notion was reiterated by Senate Majority Leader Reid in a March 11 CNN interview. “No I don’t – but I do know this – the American citizens who were killed overseas were terrorists, and if anybody in the world deserved to be killed, those three did,” Reid said, his eyes bright with the murderous fanaticism that burns away all critical thought. After all, if Reid retained the capacity for skepticism he would wonder if 16-year-old U.S. citizen Abdulraham Al-Awlaki really “deserved” to be murdered while enjoying a barbecue at the home of a friend. Evangelist for the Leader Principle: Harry Reid. “Do you think the president should be able to make that decision … without going to court, without going to you all, without anything?” Crowley asked in one last attempt extract a clear answer from Reid. “There is a war going on,” Reid recited, his face drawn into a sanctimonious smirk. “There is no question about that. He is the Commander-in-Chief, and there have been guidelines set. If he follows those, I think he should be able to do it." At least some of Obama’s Republican critics are genuinely horrified by these assertions of unrestricted presidential power; some have even called for Obama’s impeachment, which would be an entirely appropriate course of action. It should be acknowledged, however, that with the honorable exception of Ron Paul (and perhaps Rep. Walter Jones), no congressional Republican who served during George W. Bush’s administration has standing to criticize Obama’s dictatorial abuses of power. The same is true of the GOP-aligned conservative punditocracy, particularly its talk radio auxiliary. The neo-totalitarian tendencies that took root during the reign of Bush the Dumber were lavishly fertilized by the diaper filling emitted relentlessly by the likes of Sean Hannity, Rush Limbaugh, and Mark Levin and the glossy herd-poisoners at Fox “News.” They cultivated the seeds from which blossomed Obama’s nettlesome regime. 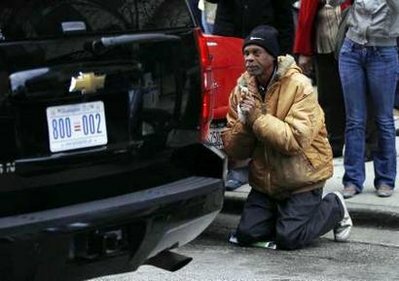 Bless me, Dear Leader: A True Believer prays to Obama. Harry Reid’s nauseating praise for presidential despotism is the same paean to Leader-worship sung by Bush’s chorus pitched in a slightly different key. In fact, some of Bush’s more passionate adherents considered him to be an adjunct member of the Trinity – a delusion he occasionally seemed to share. During a campaign stop in Lancaster, Pennsylvania prior to the 2004 election, Bush told the audience: ''I trust God speaks through me.” Some of Bush’s acolytes regarded that self-description to be too modest. The instrument has yet to be invented that can measure the infinitesimal odds that this poem reflects the spontaneous admiration of a private author, either American or Pakistani. 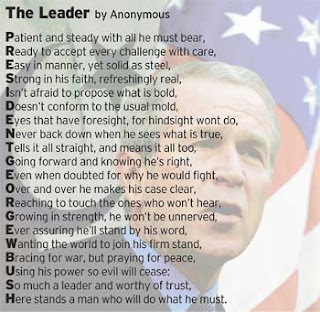 Given the Bush regime's documented efforts, working through the Rendon Group, the Lincoln Group, and similar propaganda mills, to seed “positive” stories in both the domestic and international media, it's a near-certainty that this hymn to Bush the Magnificent was extruded by an employee of, or contractor for, his regime. There is no ambiguity about the origins and intentions of “The Road We’ve Traveled,” an Obama administration campaign film produced by Oscar-winning director Davis Guggenheim and narrated by Tom Hanks. Guggenheim is the Leni Reifenstahl of the Obama administration – a talented artist entirely devoted to the cult of the Dear Leader. His 17-minute pseudo-documentary promises to be a work of unalloyed Leader-worship in which Obama is wreathed in sanctity and his every deed is depicted in a heroic light. The clinching evidence of Obama's divinity, as portrayed in his work of cinematic worship, was the supposed courage he displayed in ordering the summary execution of Osama bin Laden, which was a precursor to the assassination of three U.S. citizens. When CNN host Piers Morgan asked the filmmaker, “What are the negatives in your movie about Barack Obama?” Guggenheim replied: “The negative for me was that there were too many accomplishments.” The only other “negatives” he could perceive resulted from what he called the “toxic environment” created by those who dare oppose the Dear Leader’s infallible will and transcendently noble purposes. Guggenheim is the sort of person who would fight for the privilege of hauling the king’s intestinal residue, which – he would insist – emits the enchanting aroma of fresh-cut flowers. Lenin would recognize in value of Holder’s sophistical distinction between “due process” and “judicial process” an effort to abolish any remaining legal limits on the lethal power of the State, as incarnated in the Dear Leader. He would admire the audacity displayed by the Obama administration (as well as its predecessor) in asserting the unlimited power of the executive to kill, torture, and imprison people at whim. He would covet the instruments of mass annihilation wielded by the executive branch, and its equally destructive apparatus of mass indoctrination. And he might even spare a moment of incredulous pity for a population that is ruled by such a system while clinging to the illusion of freedom. Your donations are needed to help keep Pro Libertate on-line -- and are deeply appreciated. Thank you! Please be sure to visit Republic magazine-- and to sign up for a free digital subscription. I can't even wrap my mind around this. I remember the ridicule Nixon faced when he said "When the President does it, that means it is not illegal" - and he was defending burglary. Now we have a President defending his power to murder people and still we aren't gathering the torches and pitchforks. What will it take or is there nothing the American people won't swallow? When you peruse the wastelands of TV infotainment you realize it's a constant drive-by assault upon us of lies and obfuscations. I've read time and again, from people who like Will actually make sense, that one of the best things you can do is turn off the so-called news shows... or TV completely, and THEN you'll begin the process of setting yourself free. There really is a Matrix out there and YOU are "the ONE" who can set yourself free from it. If only you want to. I wonder if the Founding Fathers made a mistake in establishing the office of the President? I think the Founding Fathers made a mistake in fighting the Revolution, period. Those who gave their lives for the cause certainly did so in vain, as it has turned out. William, my only quarrel with your article is its title. It ascribes too much to Barack Obama the person. He, like his immediate predecessor, is an empty suite, a sock puppet, a marionette, a "beard" for the real powers behind the scenes. It would not have mattered one wit who was president on September 11, 2001. Whoever happened to be sitting on the Toy Throne on that day, whether George W. Bush, Algore, Ralph Nader, or a plastic department store dummy (the most preferable option) would have been conscripted into escalating the illegal usurpation of power by the executive figurehead and would have been forced to play the role of "The Great Decider." Similarly, if John McInsane had won the 2008 election, he would be the subject of your article, the only difference being the name replacement. The only way to put an end to this madness is to de-legitimize the entire rotten Establishment by refusing to allow it to continue to govern us. When that happens, the presidency of the United States will be as irrelevant and powerless as the presidency of the Paris Hilton Fan Club. If McInsane (heh) was in the White House the press would be baying for heads to roll due to the unconstitutional usurpations of the administration. Maybe nothing would come of it but at least they would be (sorta) doing their jobs. The liberty minded blogosphere would not be the only ones who notice these (treasonous) shenanigans. But, yeah, you are right McCain is just as power mad as Odumbo. And probably crazier due to his stay at the Hanoi Hilton. So now the Poser-in-Chief is "Double O Bama"? Good grief. Bush has been gone for over three years, do you think Grigg could get a life and stick to the issue at hand? a lot of what Bush did was bad, too. Get over it. Obama is out of control, and the very people who should be reining him in refuse to do so, in fact they see nothing wrong with it. That is the frightening issue here, and the one which needs to be addressed. I have said repeatedly in other venues that McCain is as diseased a creature as Obama, with the same agenda, but he is no longer the issue here either. This should not be a "Republicans are as bad as the Democrats" cry from the minarets (even though it is true), it should be a demand from every American that Obama be impeached for his traitorous refusal to act Constitutionally. You think we would have been better off remaining under British rule? Do you consider yourself pro-British monarchy? Ahh, Harry Reid, Nevada's finest. I have not watched tee vee since the analog signal went dead well over a year ago. (Yeah, I might pay some cable or satellite company for the sludge waste they sell). But I digress, Harry Reid was prominent then (analog tee vee dayz) as he seemingly is today. He epitomizes what America has devolved into. A highly scrubbed, disinfected, dresssed up version of Las Vegas organized crime. How else can we rationalize the decadent criminality witnessed here? his evenings going over execution lists as Stalin used to do? When the people have no protection under the law from government then the government has no protection from the people and however they should choose to deal with the illegal transgressions against them. This is made possible by God's gift of Free Will and the inherent right of free people to exercise it as they deem necessary to defend their Liberty. The saddest part of it all is that there will be a line of fellow Americans ready to kill and/or subjugate their fellow citizens because the government will give them a paycheck. The TSA is a perfect example. Under the guise of safety, the goons at the TSA are ready and willing to violate you or a member of your family for a paycheck. Jerryskids asked, "What will it take or is there nothing the American people won't swallow?" Lots of People (some anyway) are asking this question too. IMHO, there is nothing the American people won't swallow. Fluoride in combination with willful denial really works wonders. While reading a lot of comment sections these days I'm often reminded of a quote from an infamous Russian describing the gulag, the People didn't get "it" until they felt a military boot on their big fat bottom kicking them into the gates of the gulag. Bob asked, "You think we would have been better off remaining under British rule?" There are some articles addressing this question, it has nothing to do with being "pro-British". This is why I always vote R for the prez. At least the MSM will expose some of the evils. Never happens if a D is in office. In answer your first question, we probably wouldn't have been any WORSE off in the long run, considering that it didn't take long for a rebirth of aristocratic plutocracy to occur here on this side of the Big Pond. Less than one hundred years after its birth, America had begun furiously shedding its founding ideals, and at a breakneck pace. By the outbreak of World War I (which, like its successor twenty-odd years later, was fought by America largely for the benefit of our British "cousins"), America was barely distinguishable, in imperial terms, from the "Mother Nation." Were it otherwise, wouldn't we --assuming that a "government by the People, of the People, and for the People" actually ruled-- not only NOT have come to Britain's aid, but would have gone all out to remain neutral, to avoid the "foreign entanglement" of a European war that George Washington warned us about? That our ruling kleptoligarchy, a Rothschild subsidiary like the British government, did exactly the opposite proves just what a lost cause the ideals of the American Revolution ultimately turned out to be. The only difference is that at the turn of the last century, the American ruling kleptoligarchy was a British vassal, whereas by the end of the century the roles had reversed. Either way, the Constitutional Republic of the American Founders was by then long dead, the American people, by this time transformed into the Amoricon sheeple, having eagerly helped it die a slow and painful death. In answer to your second question, no, most definitely and certainly not. Anarcho-capitalism is hardly reconcilable with monarchy. Your writing always impresses me a great deal. I am a fan. If you haven't done so, would you consider putting together some recommended reading lists for those who want to be influenced by some of your influences? Second a recommended reading list! This is an excellent summation of what the presidency has been turned into! Is it just me or does it seem like the American public at large received a lobotomy back in 2001?